Joyful nature-inspired paintings in oil and watercolor. January 4th--29th, 2019 I will have an exhibit of my paintings inspired by the beauty found around my Long Island, NY area and on my travels. 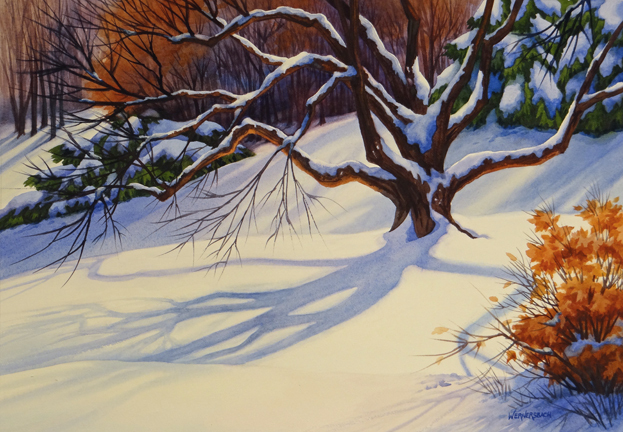 Reception is Saturday, January 5th from 2--4pm. All are invited to stop by anytime between 2 and 4pm at the Jericho Public Library, 1 Merry Lane, Jericho, NY 11753. Hope to see you there! This is "Tranquil Reflections", Oil, 11 x 14 from the Oceanside Marine Nature Study Area on Long Island's south shore. It's an oasis of nature in the midst of the suburbs. I work small--6 x 8 or 8 x 10 at the most is better outdoors where you only have an hour or so before the light and shadows change. A wet paint carry box is a must for taking wet paintings home. Since all paint needed to go in the checked bag on the plane I carefully labeled it as "Artists Colors" and put in the manufacturers safety data sheet to show that it is not flammable. Don't call it paint as that can upset the TSA. Also double bag it in ziploc bags to avoid a mess. My water-soluble oils are easy to travel with they don't need solvents for clean up--you can't bring turp or mediums on the plane. I tried using olive oil as a medium this time since I feel the water-soluble oils need a little medium to make them flow more evenly. The only problem with the olive oil is the drying time for the painting--3 weeks later and they are still damp--not a good idea! Packing cubes made it easy to keep clothes in the checked bag away from the art supplies. 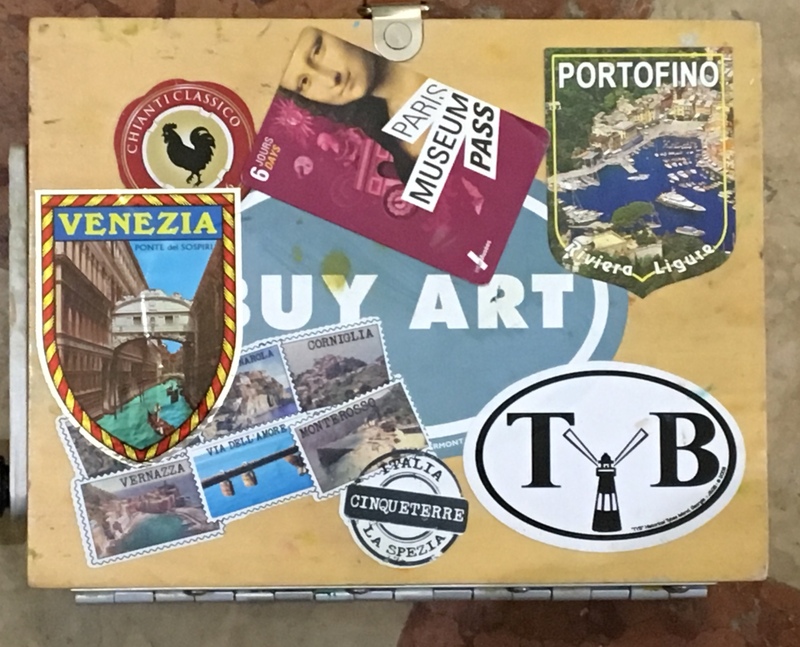 I used a backpack this time to carry my art supplies to our painting locations--it was much easier than dragging a carry on bag through the narrow cobbled streets. I kept the weight down by only bringing half tubes on paint--on small canvases I don't need a lot of paint. I carried my tripod separately. 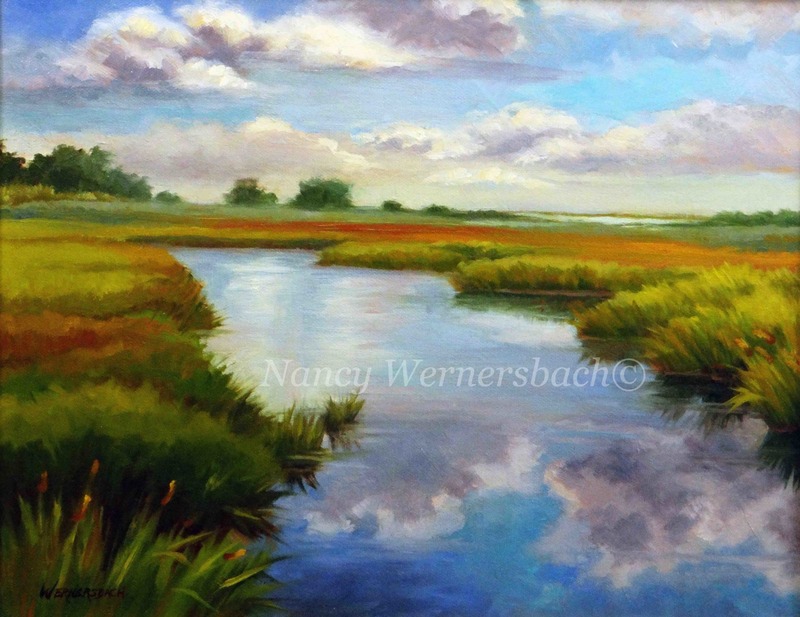 "Tranquil Reflections" ©Nancy Wernersbach, Oil, 11" x 14"
Glad to be part of the National Art League Members' Exhibit at Barnes Gallery, 2 Nassau Blvd., Garden City South, NY 11530 , 516-538-4503. Reception on Saturday, Feb. 3rd, 2018 from 5:30 to 7:30pm--Barnes always provides a beautiful show space and reception with live music and great food! 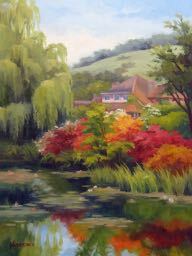 Greg and Herbert are wonderful to work with whether you are buying a painting or framing a piece of artwork. Stop by! The show is up through February 28th, 2018. 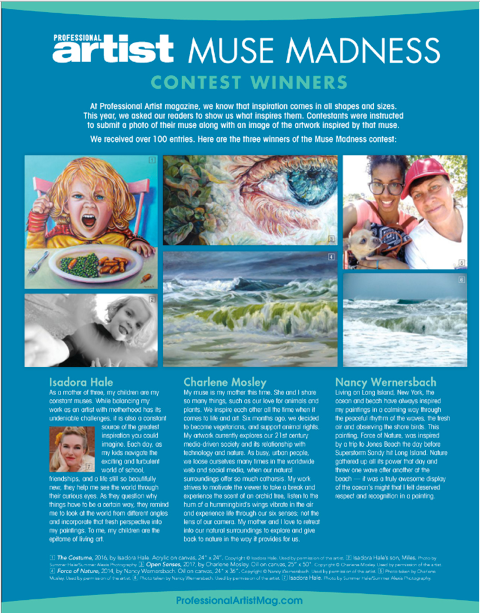 I was very pleased to be one of 3 artists chosen by Professional Artist magazine for their "Muse Madness" contest! The contest focused on artists' inspiration, and the ocean is a favorite place of mine to look for inspiration. Featured is my photo of the stormy sea taken at Jones Beach, Long Island, NY and my painting that resulted from it: "Force of Nature". 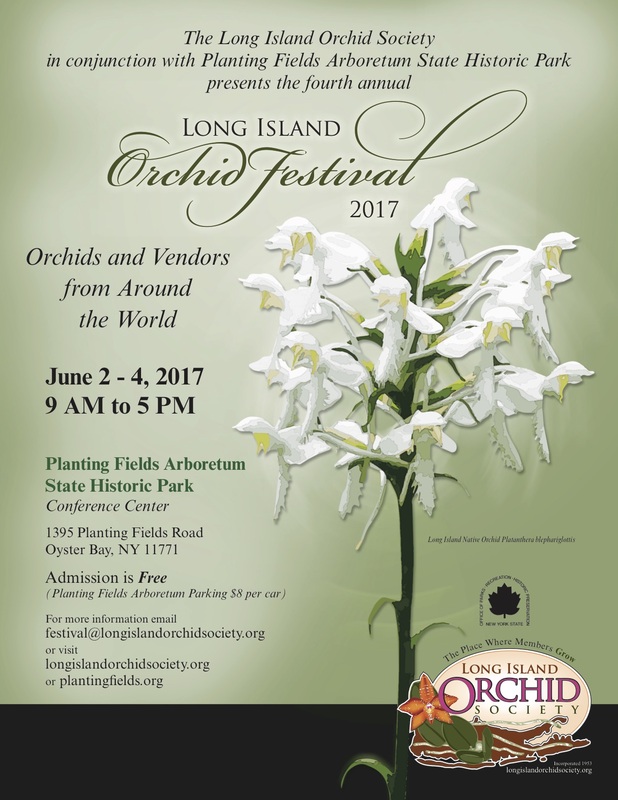 The Long Island Orchid Society will be holding the Fourth Annual Long Island Orchid Festival on June 2 through 4, 2017 at Planting Fields Arboretum State Historic Park. The festival will host numerous orchids and vendors from around the world and include lectures from advanced orchid growers. 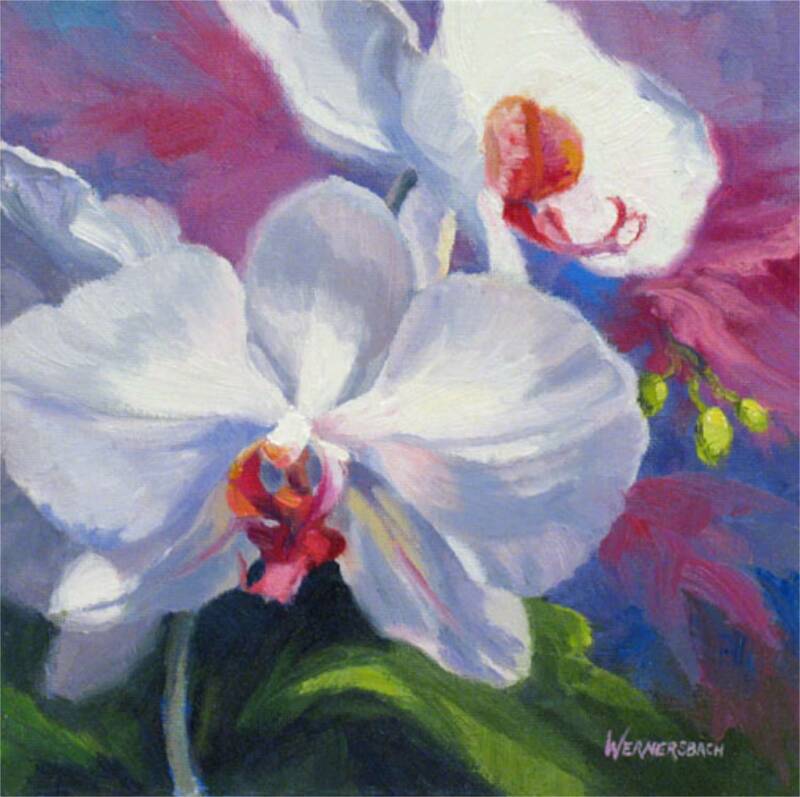 Artist & LIOS Member Nancy Wernersbach will give an orchid painting demo from 12 to 2 pm on Sunday June 4th and the finished painting will be raffled. You could be the winner of an original piece of orchid art! Art Exhibit by LIOS members and local artists. Enjoy fine art and photography that captures the beauty of flowers as seen through the artists' eyes. Long Island’s premier public arboretum and historic site located in Oyster Bay, New York. A former Gold Coast estate, the arboretum is comprised of 409 acres of greenhouses, rolling lawns, formal gardens, woodland paths, and outstanding plant collections. The original historic estate buildings remain including the 65 room Tudor Revival mansion, Coe Hall, which is open for tours spring through fall. The grounds, landscaped by the Olmsted Brothers of Brookline, Massachusetts, are spectacularly beautiful year round. Anton Papers Spring Issue features My "Blossoms & Butterflies"
So nice to see a portion of my painting "Blossoms & Butterflies" used to brighten the cover of the local Anton Papers Springtime supplement! Always a joy for me to paint butterflies and flowers: they bring a breath of fresh air and color after the winter doldrums. House portraits make a great gift! 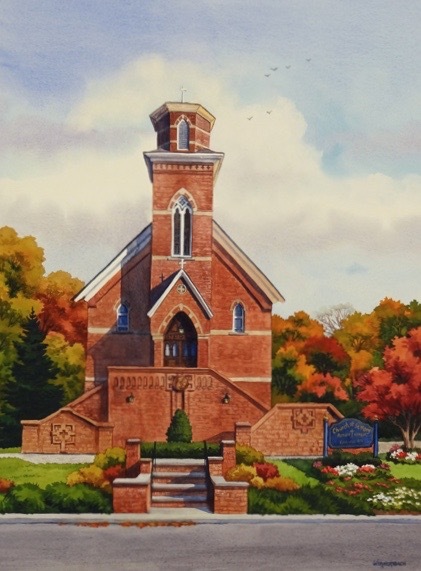 Watercolor by Nancy Wernersbach©2016, 16" x 20"
A portrait of a beloved home can make a special gift that has meaning for many years to come. I was pleased to do this painting for my cousin--it was a surprise Christmas gift which made it all the more enjoyable. Her husband sent me photos and even paint swatches as the color in the emailed photo came out more blue than the actual paint color of the house. Why not just take a photo and frame it? Well a painting goes way beyond the limits of a photograph which is a record of what is actually there at the time. The photo was early spring without any flowers or much foliage; also unwanted nearby houses crowded in and the sky was gray. 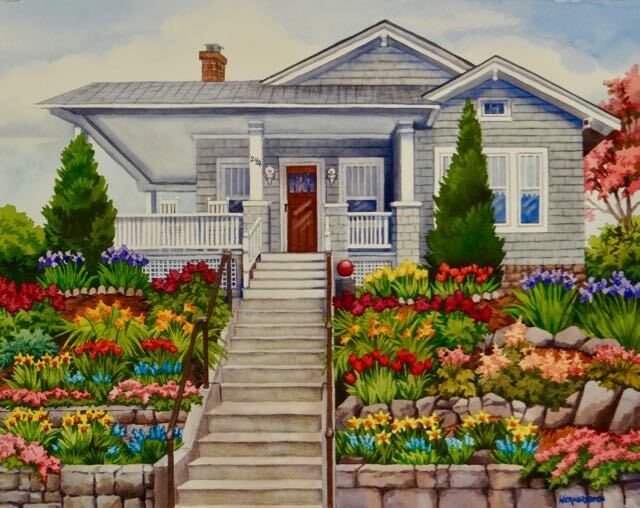 For the painting I took liberties with the flower plantings and foliage to give the scene a burst of color and life. Of course it had to be a sunny day with a blue sky and some clouds--all things are possible in a painting while still staying true to the original look of the house and landscaping. Next time you are stuck for a special gift think of a house portrait for a friend or family member! Now on exhibit and for sale at the Cold Spring Harbor Library are my paintings of the many beautiful locations on my home of Long Island, NY. Though it may seem like this area so close to NYC is nothing but endless traffic and shopping malls you have only to take one step off the beaten track to find beautiful preserved mansions and their gardens, vast state parks with majestic trees, and of course the beaches! The East End, home to the Hamptons and North Fork wineries, is a whole different world of charming small towns and a slower pace of life. Come and enjoy some of these places through my paintings! All are invited to the Reception on Sat., Sept. 10th from 2 to 4pm. The show is on exhibit through Oct. 30th. Cold Spring Harbor Library, 95 Harbor Rd. (25A), Cold Spring Harbor, 11724. Heading north on 25A towards the village of Cold Spring Harbor you will see the Harbor Mist Restaurant on your right. Next is a white sign for the Library. Turn right and follow driveway up to the Library. My exhibit in on the lower level. Article and Cover of Summertime Anton Publications special issue! 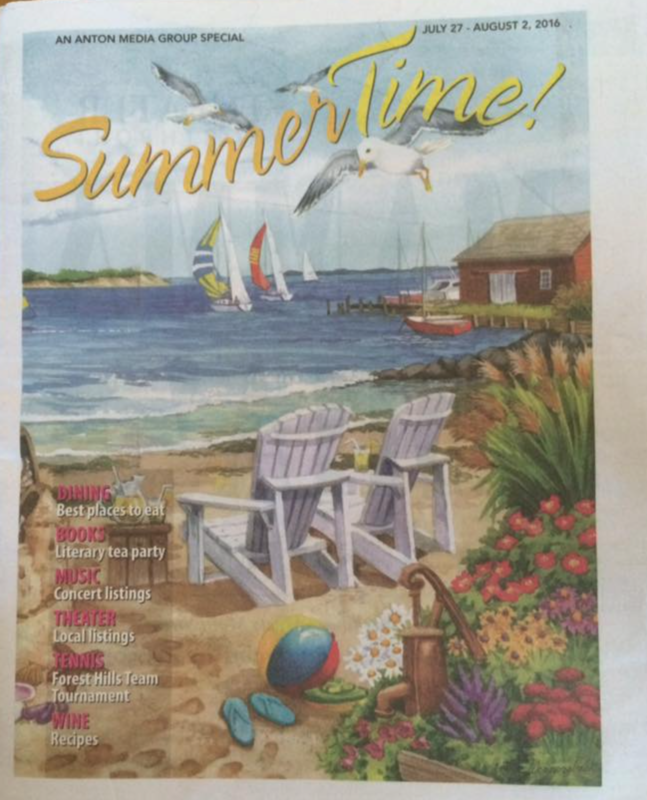 Glad to have my painting "Beach Cottage Summer" ( a cropped portion of it actually) chosen for the special "Summertime" issue for the Anton Papers (village newspapers across Nassau County, Long Island). The full size image is one of my illustrations available as a jigsaw puzzle from SunsOut. 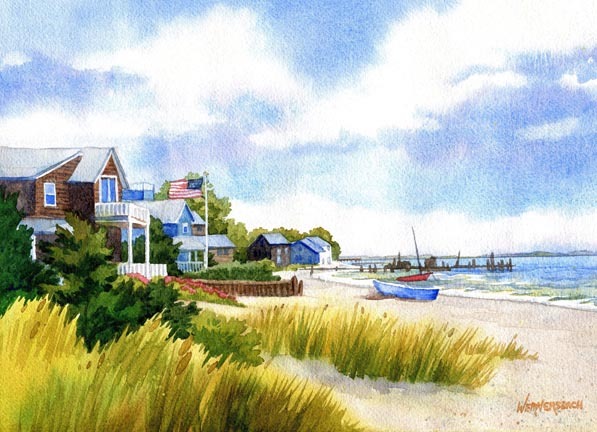 It expresses the best of summer here on Long Island, New York--there really is no need to go on vacation here in the summer: we have the best beaches, scenie villages on the East End and Hamptons, wineries and plenty of shopping! Thanks to Alex Nunez of the Anton Press who saw my work at a show with the Westbury Arts Council and asked to see my artwork. The image is also available as fine art prints--please contact me for pricing and sizes. I was very pleased to receive an Award of Excellence for this painting from judge and artist Robert Carter at the Art League of Nassau County Spring Membership Exhibition on through April 21st at the Locust Valley Library, Locust Valley NY. Art league membership is a wonderful way to make new friends with your passion for the arts and to exhibit your work. To me paintings are to be shared with the world and they do no good sitting in a closet at home! For more information about the ALNC, please see the League's website: www.artleagueofnc.org. 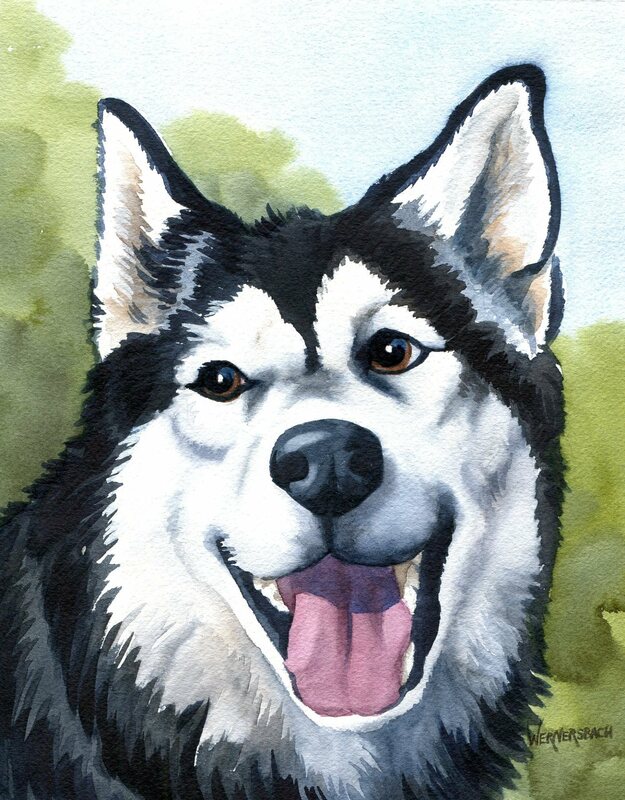 "Kodi", Watercolor, 10" x 8" "Freddy", Watercolor, 10" x 8"
Pet portraits make great gifts and are fun to paint. Good reference photos are a must! 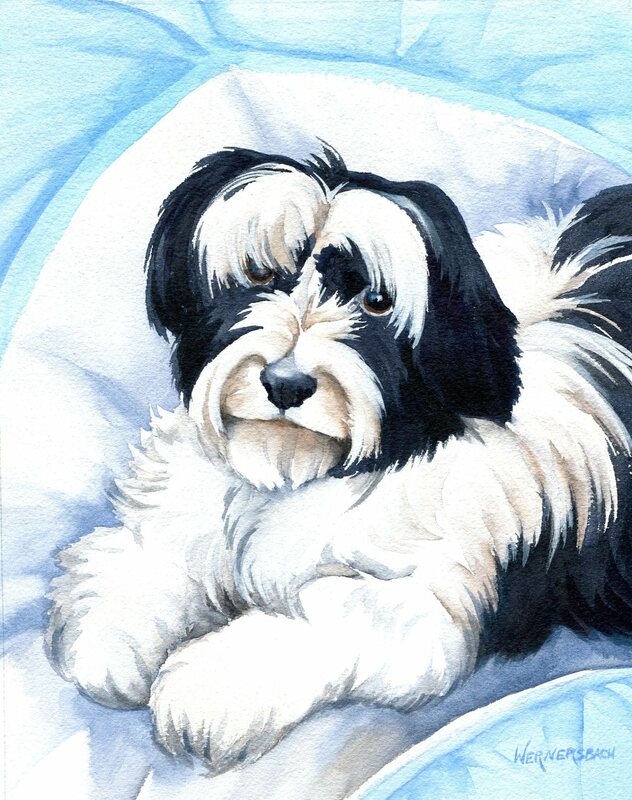 The eyes are everything and you need to pay attention to the little differences in fur and coat color pattern and expression that give each beloved pet their own personality. Commisions can be challenging and wonderful adventures in painting. 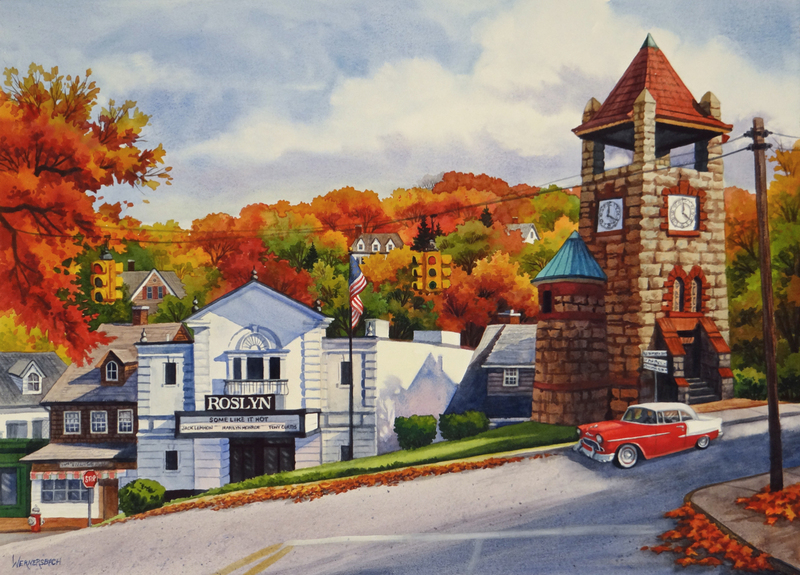 My client asked me to paint the iconic clock tower and movie theatre of the picturesque village of Roslyn here on Long Island, NY. But here's the tricky part (as if all the architecture was not challenging enough!) I had to add in his parents' car and the movie they saw when they met "Some Like it Hot" to the movie theatre marquee. Fortunately he had photos of the car which helped. And thankfully when I went to take pictures it was a beautiful fall afternoon with great shadows, light and color in the foliage. It makes painting so much easier when you have the right reference material. It was a success and hopefully will be a cherished part of my client's home for many years to come.